My inner bookworm just went crazy. I am so giddy that The Hunger Games: Catching Fire will be coming out November 22nd. But I am even more excited to let y'all know that you and a friend could be selected to receive tickets to the advanced screening here in Houston on November 19th! 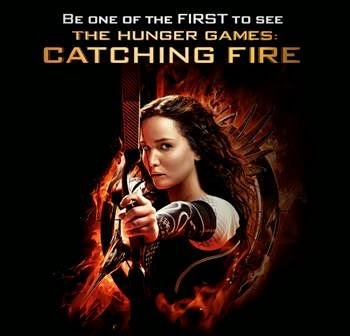 You'll be able to see the second installment of the trilogy where Katniss Everdeen, played by the lovable Jennifer Lawrence, and Peeta Mellark, played by Josh Hutcherson, are on their "Victor's Tour." During the tour, Katniss begins to notice that a rebellion is in the works. But the Capitol still has a lot of control over the districts and is preparing for the 75th Hunger Games. The movie will be a heart pumping story told about the inevitable struggle that is about it ensue. You don't want to miss this movie or this opportunity #SpoiledOnes! This trailer will get you even more excited!